The Dekhon Model has been designed to address the primary obstacle in the search for quality medical treatment - availability. 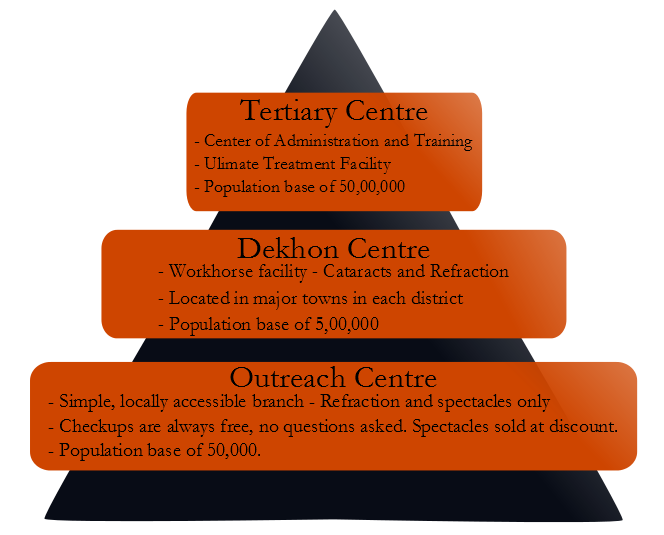 Dekhon aims to set up a "bottom-up" structure of eye-facilities, beginning with basic facilities as the foundation and working its way up to more complex hospitals towards the top. It is a system that functions from the ground up, thus detecting problems early through widely-available basic checkups, and then referring complex issues upward for full treatment. At the most basic level will be the Outreach Centres. These will be simple buildings capable of administering basic checkups, as well as prescribing lenses to correct refractive errors. Each Outreach Centre setup will be in a population base of around 50,000. They will be located not more than 50 km away from a Dekhon Centre. Checkups within the centre will be performed byVision Technicians, and outside of the centre multiple Vision Guardians will take eye-care directly to the patients. The Vision Guardians will go door-to-door, each with a population base of about 5,000 people, spreading information about the importance of eye-care and performing distance tests. If a problem is detected, theVision Guardian will refer them to the Outreach Centre, to ensure that as many people as possible are getting the attention they need. If the problem exceeds a refractive error, patients will be referred to the next level in the system- the Dekhon Centre. Dekhon Centres, located in a more densely populated (~5,00,000) centrally located city, are capable of performing basic surgeries, primarily cataract, which accounts for almost 80% of blindness cases. Should the patient require a more advanced surgery, they would be sent to the final stage of the system, the Tertiary Centre. For Dekhon, Shri Ganapati Netralaya in Jalna will serve as the Tertiary Centre, as well as the centre for system maintenance and planning. Shri Ganapati Netralaya is a state of the art hospital that is capable of seeing up to 1000 patients per day at full capacity. This tertiary centre can cover a population base of up to 50,00,000. The structure of the Dekhon Model, which spreads eye-care out to serve as large an area as possible, also addresses the problem of availability in another way. These different levels are organized into groups known as Clusters, to provide care in a modular and structured way. Apart from the actual facilities, another factor that may stand in the way of quality eye-care is cost. However, Dekhon aims to eliminate this factor entirely, by providing completely free eye-care to all those who qualify. In this way, we can start to make accessible eye-care a reality for everyone.